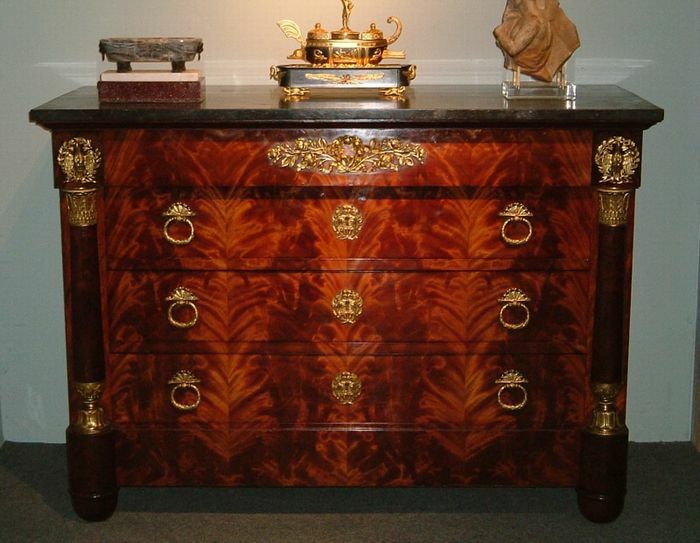 Early 19th century, Restauration, mahogany and ormolu commode. Fine ormolu-mounted, Restauration commode in well-figured, mahogany veneers, with the original, black, fossilised marble top. France, circa 1825.<br> H:-36.5"<b>93cm</b><br> W:-52"<b>132cm</b><br> D:-22.75"<b>58cm</b><br> <br> <br> Sold. Fine ormolu-mounted, Restauration commode in well-figured, mahogany veneers, with the original, black, fossilised marble top. France, circa 1825.